SOLUTRANS, the international show for Road and Urban Transport solutions, held from 21 to 25 November 2017, recorded an unprecedented increase in visitor numbers. Over its five-day duration, the trade show welcomed 48,240 visitors, representing a 34% increase on the 2015 show. The number of companies represented by visitors grew by 20% this year. 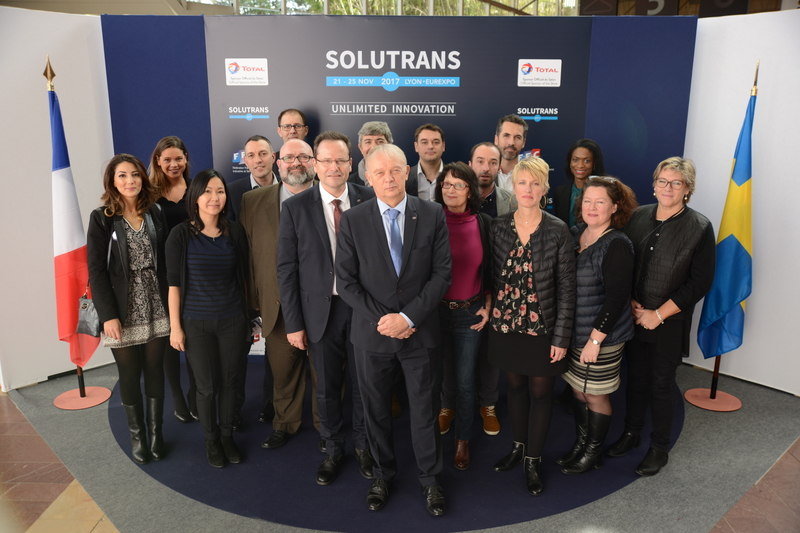 With 610 exhibitors and represented firms, up 30% compared to 2015, and also with 45% of new exhibitors and 24% of its exhibitors from abroad representing 18 countries, the 2017 edition of SOLUTRANS proved to be an exceptional success: a reward for the extensive efforts undertaken over several years by the French Bodywork Federation, FFC. The event today stands out more than ever as the trade show par excellence that gathers together all of the stakeholders in the road and urban transport ecosystem. The exhibition was inaugurated on Tuesday 21 November by Ms. Elisabeth Borne, the French Minister for Transport, and Mr. Tomas Eneroth, the Swedish Minister for Infrastructure. During her visit, Ms. Elisabeth Borne reasserted the government's support to the sector and noted "the awareness of environmental issues and the commitment of the sector to the energy transition and the digital revolution." On this occasion, Ms. Elisabeth Borne was also presented with the white paper "Natural gas for the heavy duty vehicle industry," drawn up by the French Bodywork Federation (FFC) and the French Association for Natural Gas for Vehicles (AFGNV) under the aegis of the works of PFA, Automotive and Mobility Sector. On an upbeat economic backdrop, professionals from the transport world came together at SOLUTRANS with firm investment plans. Exhibitors noted a very positive business climate and wrote a great many orders, representing turnover estimated at more than 200 million euros. 3 start-up villages welcomed, for the first time, young firms presenting new innovative solutions which could become the standards of tomorrow. the "Low emission driveline" award, organised by the CARA hub (formerly LUTB RAAC) and PFA, Automotive and Mobility Sector, went to RENAULT TRUCKS. With 24% of its exhibitors from outside France and 11% of its visitors also from abroad representing 30 countries, SOLUTRANS 2017 has reinforced its international status, in particular on European and North African markets. In addition, on the occasion of "Sweden Day" organised on Wednesday 22 November by Business Sweden and the Swedish Embassy, the show welcomed a delegation of Swedish officials and experts. The 5th meeting of the industrial and urban vehicle sector offered insight into the key challenges facing the sector: the factory of the future, new motorisations and energy, connected vehicles and roads, deliveries in city centres, training and cybersecurity. This first-time content was highly appreciated by more than 1,000 attendees. More than 2,700 people, both exhibitors and visitors, took the opportunity throughout the five days of the show to test transport and logistics vehicles and equipment on the demonstration zone and in the three outdoor exhibition areas. Eleven modules dedicated to training, brought together on the FFC stand and placed under the banner of new technology (robotics, digital, virtual reality) welcomed more than 1,700 students and apprentices from the different professions of bodywork and transport. Finally, on the initiative of FFC and its chairman Patrick Cholton, the brand new award of "Industry Personality of the Year - Industrial and Urban Vehicles" whose judging panel was chaired by Eric Poyeton, the chief executive of PFA - Automotive and Mobility Sector, was presented to Jean-Dominique Senard, CEO of Michelin. This award was made by the former French Minister Luc Chatel and the rugby international Frédéric Michalak at the gala evening held on Wednesday 22 November, which also offered an illustration of the success of SOLUTRANS 2017, with more than 1,200 guests in attendance. Make a date for 2019! The next edition of SOLUTRANS will be held from 19 to 23 November 2019 at Lyon Eurexpo.